Who ruled their world? Charlemagne? The Pope? 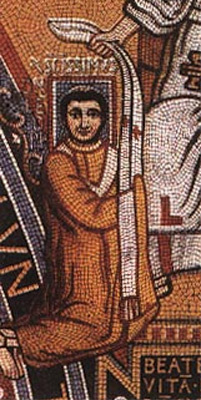 The Pope was Leo III. He was certain it was him – because he represented God – even though he had needed Charlemagne to take his side against those who wanted him out of St. Peter’s chair. In typical fashion, the Romans had been accusing Leo of their regular litany of crimes, including adultery and perjury. Untypically, they wanted to put his eyes out and cut out his tongue. Leo fled to Charlemagne, who backed him and put down the rebellion. 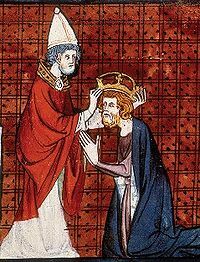 To showcase his power as Pope, Leo wanted Charlemagne to come to Rome for the Christmas services in 800 and let Leo crown him Holy Roman Emperor in front of everybody in a great ceremony. 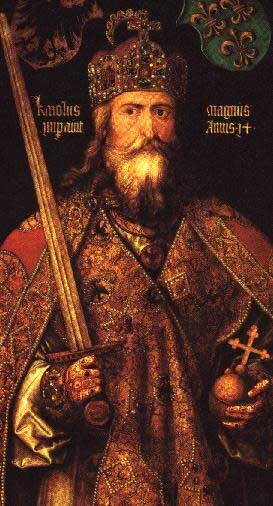 Charlemagne, then nearing 60 and the most powerful leader in Christendom, said he would happily come to Rome, but there was no way Pope Leo was going to put a crown on his head. He said the only person with the qualifications to do it was himself, so if it was to be done at all, he would crown himself Holy Roman Emperor. Charlemagne went to Rome with his retinue and attended Christmas Eve Mass at St. Peter’s Basilica. While Charlemagne bent his head in prayer, Leo rushed up and plopped a jeweled crown on his head – I now crown you Holy Roman Emperor. Charlemagne was furious, but Leo had won. People are still debating if Charlemagne really knew it was going to happen and his anger was just for show.